Tippmann Paintball Guns are famous for their legendary durability and reliability. A Tippmann paintball marker will keep shooting through dirt, mud, sand and other conditions that shut down other brands. 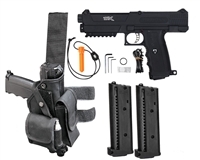 Tippmanns are the #1 recommended beginner paintball gun for their easy maintenance and simple operation. ActionVillage is committed to offering all Tippmann markers, from entry level to advanced models. Shop AV for all Tippmann paintball markers & accessories. In Stock. Lowest Price Guaranteed. Right Now.